There could be a limit on how much solar power can grow. That’s because the more solar power we add to the grid, the less valuable it becomes. It’s a simple supply-and-demand story: solar reaches peak generation during sunny afternoons, but there’s a limited demand for such additional power during those times. 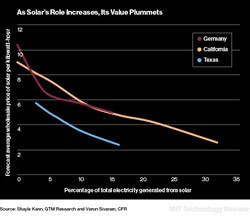 As a result, solar begins to compete with itself, driving down the price that utilities are willing to pay generators.